Very little research has been undertaken on the impacts of human toilet waste disposal in non-serviced sites in the wild. The objective of the present project was to determine the relative impacts of the mechanical disturbance of digging during the burial of toilet waste (faeces and toilet paper), and urination, on Tasmanian vegetation types that occur in areas used for wild country camping, in order to develop appropriate guidelines. The mechanical disturbance of digging cat-holes 15 cm deep, typical of those used for toilet disposal in the Tasmanian wild, had largely negative effects on the growth of a few native plant species. These effects were of little or no conservation significance. The nutrient additions simulated by the addition of artificial urine to undug ground and dug ground had largely positive effects on nine distinct types of native vegetation, encouraging the growth of many plant species at many sites, while discouraging the growth of moss at one site. No weed species found at any of the sites were significantly affected by the treatments. 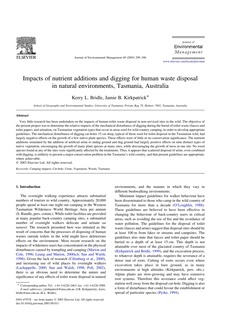 Thus, it appears that scattered disposal of urine, even combined with digging, is unlikely to present a major conservation problem in the Tasmania's wild country, and that present guidelines are appropriate, where achievable.